officials of the Crown, June 19, 1771. Home was 8 miles south. 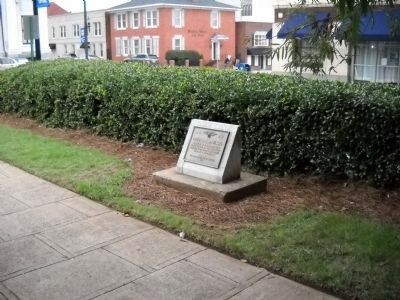 Erected 1981 by National Society Daughters of the American Revolution - Capt. Benj. Merrill Chapter. Location. 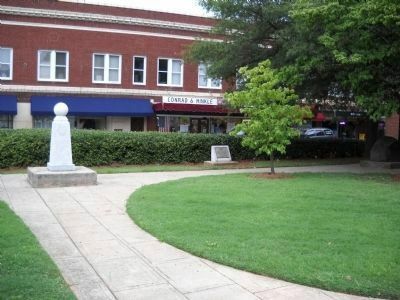 35° 49.461′ N, 80° 15.2′ W. Marker is in Lexington, North Carolina, in Davidson County. Marker is at the intersection of N Main Street and W Center Street, on the right when traveling south on N Main Street. Touch for map. Marker is in this post office area: Lexington NC 27292, United States of America. Touch for directions. In 1771, a group of backcountry farmers referred to as “Regulators”, fed up with high taxes, dishonest sheriffs and illegal fees imposed by the British Crown, rebelled against royal governor William Tryon. Tyron’s militia defeated the Regulators in what was called the Battle of Alamance and sentenced six of them, including Capt. Merrill, to death. (within shouting distance of this marker); The Homestead (approx. 0.3 miles away); Wm. Rainey Holt (approx. 0.3 miles away); Pilgrim Church (approx. 3.1 miles away). Touch for a list and map of all markers in Lexington. 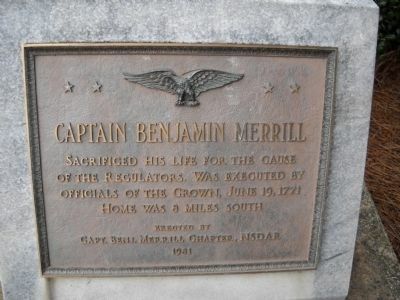 The Captain Benjamin Merrill marker (center) is one of several located across from the Old Davidson County Courthouse. 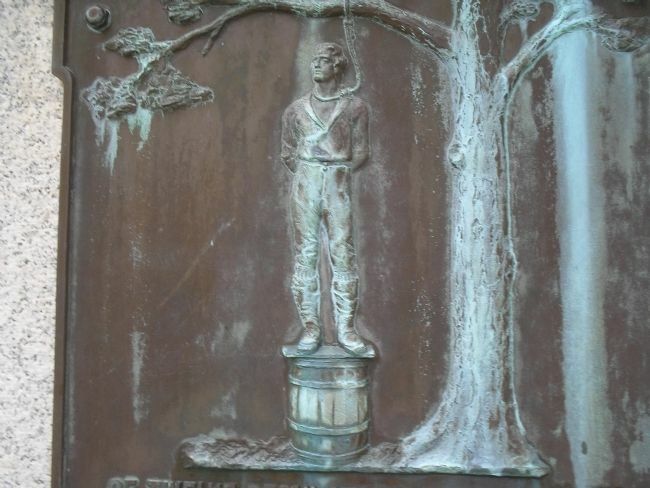 This relief plaque, from a monument on the Alamance Battleground, depicts one of the Regulators (possibly Merrill) about to be executed. More. Search the internet for Captain Benjamin Merrill. Credits. This page was last revised on June 16, 2016. This page originally submitted on August 14, 2010, by Bill Coughlin of North Arlington, New Jersey. This page has been viewed 1,449 times since then and 15 times this year. Photos: 1, 2, 3, 4. submitted on August 14, 2010, by Bill Coughlin of North Arlington, New Jersey.